1.1 IS IT WORTH EATING LENTILS? IS IT WORTH EATING LENTILS? Lentils bring so many proteins that can be considered a food alternative to the use of meat. 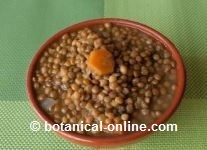 100 g of lentils, amounting to a cup of them, contribute only 8.91 g of protein and 114 calories. 100 g fillet of beef provides about 30 grams of protein, but also provides more than 300 calories. Pork meat about 28 g protein per 100 and more that 300 calories. The same amount of chicken would bring on about 25 g of protein and about 213 calories. So, we can eat more lentils that meat. We will feel satisfied and will increase the proportion of protein. Equating the calories, eating more lentils, we will see that the protein content ingested is almost the same than if we eat meat. 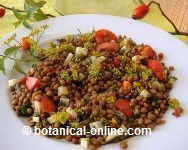 Lentils provide energy, vegetable protein and many minerals. They are rich in magnesium, which is the second constituent of bone mineral, and has great importance as a muscle relaxant. This food is suitable to help prevent osteoporosis, recover from sport, and to combat nervousness and stress. Lentils are known for their richness in iron, although the iron content is not absorbed as well as iron from animal foods. However, they do contain other important nutrients for anemia and folic acid, which helps form red blood cells. Combining lentils with foods rich in vitamin C increases iron utilization. For people whom lentis may cause them flatulence, they can treat to spice up the dish with fennel and taking a yogurt for dessert (prebiotics help reduce gas). No. In fact, legumes are a highly recommended food group for people who want to lose weight. In general, they contain plenty of fiber, both insoluble and soluble, so they prevent constipation and fight cholesterol. They also contain high amounts of starch that produces a great satiety and may keep the body without feeling hungry for a long time, since these carbohydrates are released gradually and stabilize blood sugar levels in the blood. Its content of fat is low. Of all of them, soybean has more fats, although with more quality, since most of them are unsaturated.